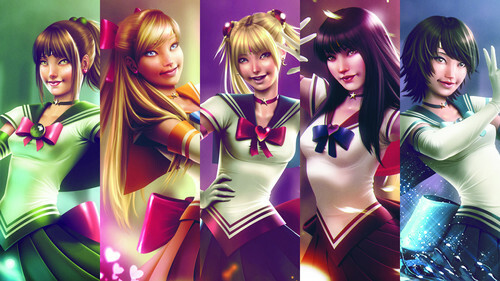 Real Life Sailor Scouts 2. Real life Drawing of the Sailor Scouts. HD Wallpaper and background images in the 美少女战士 club tagged: sailor moon sailor moon venus mercury mars jupiter. This 美少女战士 wallpaper might contain 吸引力, 感染力, 辣味, 热情, 上诉火辣, 肖像, 爆头, 特写镜头, 特写, and 爆头特写.